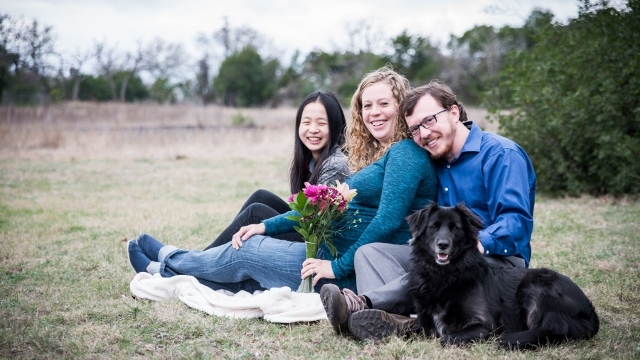 Kristen and I have been married for coming on 5 years and live in Austin, Texas where we also host a sweet international student from China named Renee. The most important thing in our lives is our faith and we always seek to remain grounded through worship of our Lord Jesus Christ and remaining active in His body in Austin where we attend Harvest Bible Chapel. I work as a Chemistry teacher in southeast Austin and have been at the same school for 8 years now. I love working with the kids and enabling them to gain greater understanding of the scientific realm and how to think effectively. Kristen has been working as a self-employed personal trainer and pastry chef for the last few years, but is going into teaching PE at a small, private, university model school this fall. She loves working with children and people of all ages in order to help them improve their health and wellness through fitness and exercise and eating high quality food without spending too much. Renee is currently visiting family in China, but will be returning to live with us in the fall to attend school as a sophomore. As a family, we love to travel, hike, garden, and many other random hobbies around our house, around the city, and across the country. As many of you who know us are aware, Kristen and I had to say goodbye to our second daughter earlier this year in March. We and the doctors did everything we could to help her, but her heart defect was more severe than anticipated and she passed away about 9 hours after birth. Our second loss in two years was utterly devastating, but, after praying and discussing with our church elders, we decided to begin the adoption process. We filled out the initial application for Generations Adoptions on March 23rd anticipating that the process would be long and drawn out, allowing us to move forward step by step; healing a little bit over time and throughout the process. Well, God had different plans! On April 17, a birthmother reached out to us through a mutual friend. After meeting the birthmother, praying, and talking to our agency, we committed to adopting her baby that was due in September. We began going through the paperwork and training classes to prepare to welcome the little guy into our family in the late summer. But again, God had other plans. While we were up in Wisconsin visiting my grandparents in mid June we received a call that the little guy was on the way despite the fact that he was only 28 ½ weeks along. We drove through the night to get to San Antonio where he was transferred to the NICU. Exhausted, we finally got to San Antonio and got to meet the little cutie. However, because he came so unexpectedly, we had not finished our Home-study paperwork, so while visiting him frequently and cuddling with him as often as possible, we spent the next couple of days hammering out as much paperwork as we could. Now, our paperwork is complete and our little guy, now affectionately dubbed our Little Curveball (we can’t really share his official name at this point due to confidentiality), has been officially placed in our care by the agency. He is so cute and we love him so much!!! However, we are now in need of paying all of the agency fees to wrap up our adoption. The total adoption fees will likely run $26,500 not counting any additional we might have to pay for medical expenses (although we think we should have most of that covered). Through our own savings and by carrying over left over from those who helped us with Tahlia’s expenses, we have about $16,500 covered. That still leaves us with a chunk that we are trying to raise funds to help us complete the adoption. Ultimately, our greatest need is for prayer as we embark on the adventure of loving and parenting our sweet Little Curveball and seeking to raise him in the love and truth of Jesus Christ. We welcome any prayers for his health and our wisdom in loving and caring for him that you can offer! However, if you are able to assist us financially as well, we would also really appreciate any amount you might be able to offer. Congratulations! So happy for all of you!! God bless you and sweet little Curveball! Adoption is such a sweet picture of God's unique love and plan for each if us! May God bless your family on this new journey! The Rivas family loves you so much. Bless you and your family for caring for God's children. You both have so much love to give and I cannot wait to see your family grow and expand! Love you Kristen! This is such exciting news and such a gift from God. You guys will be amazing parents to your little Curveball. We are so happy for you. We are so excited for you guys! Sending our love and prayers! Hit a home run with that curveball! Praying for God's blessings and love to be felt in tangible ways!! Congratulations on your new family! Praying for your little one, may the Lord bless your family! I am so happy for you all, and I wish you only the best. Please let me know if I can do anything else to help. We are so happy for the new little Piehl... keeping you all in prayer. God bless you guys and your willingness to adopt! I wish you all love and wellness. Praying for y'all and so grateful the Lord has brought him into your life! I'm so glad Curveball has found the family he finally belongs in and that you two are finally getting the family you more than deserve. My little brother is adopted, and he is one of the best things to ever happen to our family. I wish I could donate more. Kristen and Clayton, I am so moved by how God is working in your lives!! I love the term "your little curveball" because God's ways and thoughts are higher than our own. We all know that first hand! I have been praying for him and both of you...this little baby boy will grow up knowing such love! You will be touching and encouraging many lives with your testimony. God Bless you! Praying for your precious gift from God.